A volunteer cook from Exeter who has dedicated the past 17 years of her life to catering for people affected by brain injury is to be honoured at a national awards ceremony. Margaret Bird, 82, from Silverton village, on the outskirts of Exeter, will compete against only two other nominees from across the UK for The Stephen McAleese Outstanding Contribution to Headway Award, which will be presented at an annual awards ceremony organised by Headway UK – the national brain injury association. Margaret moved to Exeter from Cambridgeshire with hopes of retiring almost twenty years ago. But rather than putting her feet up, she couldn’t resist seizing the opportunity to help out at local charity Headway Devon. She has now become the longest-serving volunteer at the charity, which is dedicated to improving the lives of people affected by brain injury. And she doesn’t plan on stopping anytime soon. 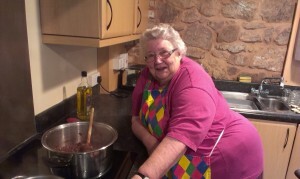 As well as catering for the charity’s training sessions, Margaret rises to the yearly challenge of cooking Christmas lunch for the entire Headway group, for which the group members have given her the honorary title of ‘Catering Manager.’ And if this isn’t enough, Margaret also signed up to be a regular cook at several of the charity’s day centres, including its largest centre, based in Exeter, which supports up to 30 people per day. “I really enjoy volunteering at the charity,” said a humble Margaret. “I got involved with Headway Devon after my daughter, Anne, was made Chief Executive of the group and I wanted to make a small contribution. “We’ve both organised a lot of different events, including camping trips and various coffee mornings. My poor health means that I’m a bit more limited than I used to be, so I’ve slowed down with the more physical side of fundraising. “But I’m still an active member of Headway Devon and I have a standing appointment to teach the group’s members how to make a decent batch of chutney – but that’s a different story! While ill-health has forced Margaret to finally hang up her apron at the day centres, her spirit and enthusiasm have certainly not dampened. She continues to serve as an advisor to the group’s Board of Trustees, attends regional meetings for the national charity and volunteers at a range of fundraising events, including running an annual coffee morning as part of Headway’s Action for Brain Injury Week. Over the years, Margaret also shared her other skills with the group by running her own sewing and craft sessions for brain injury survivors and their carers, including a rug-making class that proved very popular with members of the group. Margaret was nominated for the award by Holly Keatings, who works at Headway Devon. Holly said: “Even though she is now in her 80s, Margaret is always the first person to offer assistance when we appeal for support. She is hugely popular with the people who use our service, thanks in part to her delicious home-cooking, and she has been instrumental in delivering fundraising and awareness events for the charity. “Margaret has always been well-known for going above and beyond the call of duty – even camping overnight at the Devon County Show on a few occasions to ensure that our stands and materials were kept safe. “She’s the sort of person who would stay in the background if you let her, so it is fantastic she’s finally being recognised for all her hard work for the charity. The Stephen McAleese Outstanding Contribution to Headway Award will be presented by double Olympic gold medallist and Headway Vice President James Cracknell, who himself has a brain injury, at a glittering ceremony in The Dorchester Hotel, London, on Friday 5 December. Awards for Carer, Volunteer and Achiever of the Year will also be presented.